Angina is a pain or discomfort in the chest. It often has a squeezing or pressure-like feel. This discomfort can also be felt in the shoulders, arms, neck, jaws, or back. Anginal pain usually lasts for no more than 2-10 minutes. It is relieved by rest or nitroglycerin. Stable angina — has a predictable pattern. You generally know what brings it on and relieves it. You may also know what the intensity will be. Unstable angina — is more unpredictable or severe. 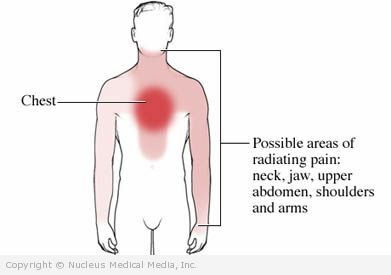 Chest pain may occur while resting or even sleeping (nocturnal angina). The discomfort may last longer and be more intense than that of stable angina. Variant or prinzmetal’s angina — occurs when you are at rest. It most often occurs in the middle of the night. It can be quite severe. 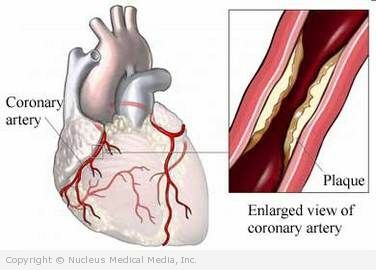 Angina is usually a sign of coronary artery disease (CAD). It occurs when the blood vessels leading to the heart are blocked. The blockage decreases the blood and oxygen flow to the heart muscle. When the heart muscle is deprived of oxygen, you will feel chest pain and other symptoms. Longer-lasting types may be used to prevent angina before an activity. May be given as pills, or applied as patches or ointments. Blood thinners — a small, daily dose of aspirin has been shown to decrease the risk of heart attack. Some may benefit from the addition of warfarin (Coumadin). There is an increased risk of bleeding with this drug. Talk to your doctor before taking aspirin daily or warfarin. Appropriately treat high blood pressure and/or diabetes. Appropriately treat abnormal cholesterol levels or high triglycerides.